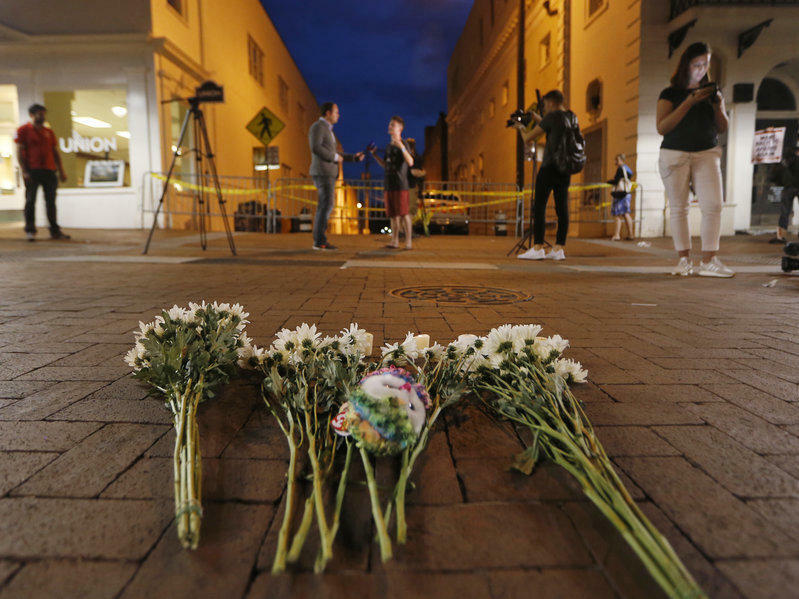 Flowers and other mementos are left at a makeshift memorial for the victims of Saturday's violence in Charlottesville, Va. This morning, political and religious leaders tried to comfort residents after yesterday's deadly attack in Charlottesville. Church leaders are also trying to address the complicated racial tensions facing the city. NPR's Sarah McCammon visited two churches this morning, one predominantly black and another predominantly white. SARAH MCCAMMON, BYLINE: The mood was somber as church goers filled the sanctuary at Mount Zion First African Baptist Church. DONNA CHURCHMAN: I'm just - I'm just - I'm sad. MCCAMMON: Donna Churchman had just finished putting on the delicate white gloves that mark her as an usher in this mostly black church, when she paused from greeting people coming through the doors. CHURCHMAN: It's really sad that We have to go through things like this because somebody Don't Like a person because of the color of their skin. MCCAMMON: Joann Jamison said she's lived in Charlottesville for decades and racism is nothing new here, but she's been distressed by the violence that broke out after the city made plans to remove a statue of Confederate General Robert E. Lee. JOANN JAMISON: It's deja vu when you look at it. I mean, think about what went on when General Lee was actually in command. This is what happened yesterday. And who was fighting when General Lee was in command? That's who was fighting yesterday. So, you know, it's history repeating itself. MCCAMMON: The heaviness of the moment was reflected throughout the service, including this prayer. JAMISON: God, we need help. Satan is busy, but we know we're in your hands. MCCAMMON: A few church members expressed surprise and frustration to see reporters and politicians in the room on a day when many had come to grieve. Virginia Governor Terry McAuliffe was there with Charlottesville's mayor and others. McAuliffe made a speech condemning the white supremacists whose rally sparked the violence this weekend. Then, standing a few feet from the pastor, the governor called for hope and quoted the words of Jesus. TERRY MCAULIFFE: In this world, we will have trouble. He also said, Reverand Edwards, as you know, take hope, for I have overcome the world. MCCAMMON: A short drive away, the mostly white members of First Baptist Church Charlottesville on Park Street were also gathering later in the morning. MCCAMMON: Church members denounced the racism, though some were hesitant to point a finger solely at any one group. Cherilyn White said she wished everyone could get along. Asked if President Trump was pointed enough in his delayed condemnation of the alt-right movement, White said racism has been a problem for all presidents, not just Trump. CHERILYN WHITE: I think it's just - it's all through history. It's on everybody's shoulders to come together, not just the president or whoever's in charge of our country. MCCAMMON: Pastor Rob Pochek framed his own denunciation of white supremacy in theological terms. ROB POCHEK: Let me be clear. The white supremacy espoused by the like of David Duke, Richard Spencer and others is a lie straight from the pit of hell that cannot coexist with the gospel of Jesus Christ. MCCAMMON: Pochek says since the violence broke out, he and other pastors here have been talking about what to say from their pulpits and how to lead their congregations through the healing that they hope will come. Sarah McCammon, NPR News, Charlottesville. Transcript provided by NPR, Copyright NPR.